Slow, enormous waves that move beneath the ocean surface have intrigued researchers for a century. These "internal waves" affect the world's deep seas in many ways, but they're hard to observe. Internal waves play a major role in mixing the ocean's water. Global climate models need to account for this mixing because it warms the deep sea and cools the ocean surface. Internal waves also move seafloor sediment and nutrients, affecting fisheries and coral reefs. And underwater operations, from oil drilling to submarine missions, need data on the deep-sea "weather" of turbulence and disturbances that internal waves produce. A new paper giving the first "cradle-to-grave" explanation of the world's strongest internal waves was published this week in the journal Nature. It's a major step forward in ocean science. Physics explains how ordinary waves, known as gravity waves, behave in water. The same physics permits gravity waves to form inside the sea wherever two layers of different water density meet. To see an everyday example, take a bottle of salad dressing, with oil on top and vinegar underneath. Instead of shaking the bottle, tilt it gently and watch the internal waves between the oil and vinegar. The ocean has many places where internal waves happen. All that's needed is two layers of water with different density. For instance, where rivers pour fresh water on top of denser seawater, internal waves can form on the hidden surface of the seawater. In the Arctic Ocean, melting ice can spread a calm layer of fresh water as the salty sea continues to roil beneath it. The world's strongest internal waves are found in the South China Sea. There, the daily motion of the tides through Luzon Strait creates internal waves hundreds of meters high within the dense layer of cold deep water under the warmer surface water. As the tides wash over a pair of large underwater ridges in Luzon Strait and slosh between them, the activity sends huge, slow-motion internal waves westward into the South China Sea. They're so slow that they barely disturb the sea surface, but satellites can observe their effects. The video below (from MIT) shows the basic mechanism. One study last year created a miniature model of Luzon Strait in a large tank at a lab in Switzerland. Ocean currents and internal waves were reproduced in the Coriolis Platform, a round pool four feet deep and 40 feet across, mounted on the world's largest turntable. The new paper in Nature added to that information with hard-won data collected in the South China Sea in 2010 and 2011. The IWISE project (Internal Waves in Straits Experiment) used research ships, subsea instrument stations and underwater gliders to collect data under challenging conditions of strong currents and treacherous seas. Instruments recorded levels of turbulence in Luzon Strait more than 10,000 times stronger than the oceanic average. This data yielded a detailed picture of how the internal waves are generated, why they only move west from Luzon Strait instead of both ways, and how they break upon the undersea slopes of the South China Sea. The researchers also learned how the internal waves interact with the powerful Kuroshio ocean current. Scientists can make good use of this new analysis. Internal waves form all over the ocean -- particularly in island chains like Hawaii -- just as strong winds create internal waves in the atmosphere near mountain ranges like the Sierra Nevada. And these subsurface waves break along shorelines that have wide, shallow offshore shelves, like the U.S. east coast. 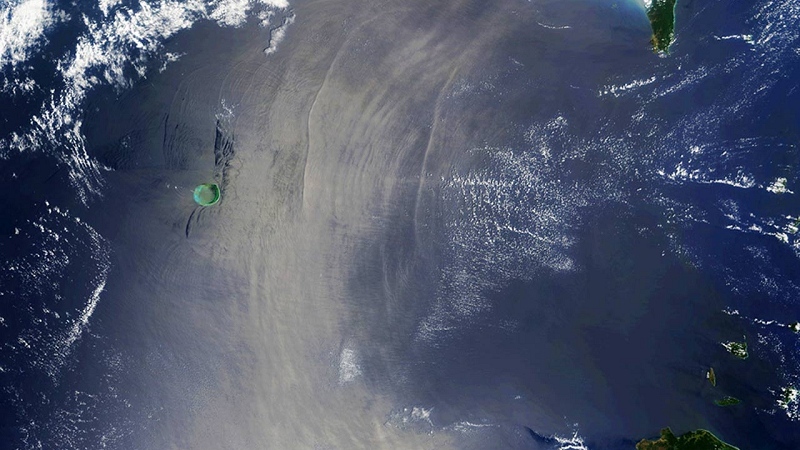 NASA Visible Earth collection has many examples of atmospheric and oceanic internal waves seen from space. A brief tutorial in the journal Oceanography gives more detail for those who've studied introductory physics. And a site called Internal Wave Atlas presents 86 case studies from around the world.